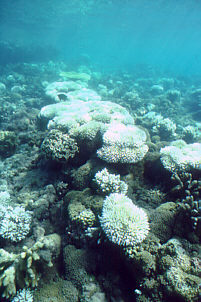 Reefs worldwide are threatened by increasing human-induced pressures. The corals on the left were bleached by high temperatures duing the 97-98 El Nino event. Growing numbers of coral bleaching events are believed to be linked to global climate change, primarily elevated temperature, caused by release of greenhouse gases, mostly carbon dioxide, generated by consumption of fossil fuels.here to ayour text. 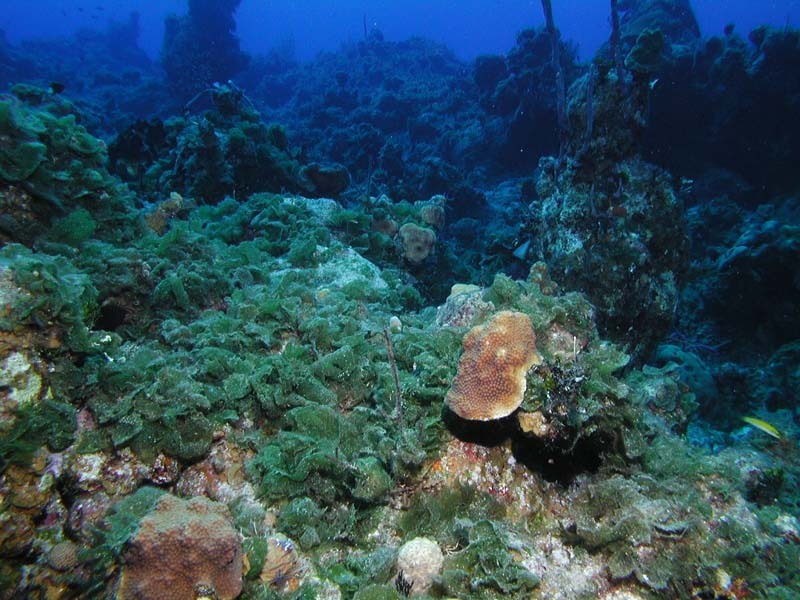 Other reefs, such as this reef on San Salvador in the Bahamas, have become overgrown by macroalgae. The overgrowth is believed to be the result of a number of causal factors acting synergistically. These include the die-off of the herbivorous long-spined sea urchns in 1983, overfishing of herbivorous fishes, and increased levels of nutrients in the water. SeaServices is actively researching the effect of global climate change on coral reefs. Dr. Ware, the President of SeaServices, is a former officer and Member of the Council of the International Society for Reef Studies. Dr. Ware is available, at no charge, to talk to dive clubs, college classes, and other organizations on the subject of Global Threats to Coral Reefs. Contact him for more information. More about coral reefs and their current status can be found at:d your text.